Hi YABC! 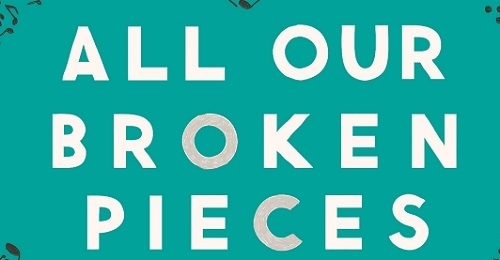 I’m so excited to be here to share the cover for my YA Debut All Our Broken Pieces. When I first saw my cover, my eyes welled with tears at the thought and care that was put into the design. I remember sending in my “wish list” expecting nothing but hoping for the best, and when I saw it… it was everything I’d hoped for and then some. It’s a beautiful illustration that I think fits the story inside perfectly. There isn't one thing I don't love about it. Liz Casal is the genius designer behind it and I can’t thank her and the entire team at Hyperion enough for making my dream cover a reality! L.D. Crichton is the author of THE ENCHANTMENT OF EMMA FLETCHER, which received a starred review from School Library Journal. She’s a coffee devotee and lip gloss enthusiast whose infatuation with music is truly astonishing. If she’s not reading, writing, or checking her horoscope for signs from the Universe, you can find her by the water in search of mermaids because they're real. ALL OUR BROKEN PIECES is her first young adult novel. Three winners will each receive a signed copy of ALL OUR BROKEN PIECES, when available. I love the cover! It is beautiful! The synopsis sounds amazing! The cover doesn't amaze me, but I love the character names in the snyopsis! The cover is stunning!! Eye catching and different!! The synopsis sounds amazing. Lennon seems to have OCD and Kyler seems to have some deep dark secrets he hides from the world. I would love to see how these two characters lives collide and how their relationship develops. I love reading books where teens have issues but intertwine into a possible love story. I am completely intrigued. The cover demonstrates these separate characters coming together. I thought the synopsis sounded interesting. Ah... a muse. Interesting story dealing with OCD - a very real issue with teens. Beautiful cover and it sounds like an original and interesting book!